There is perhaps no area of British life where attitudes are more strongly influenced by shared traditions and past experiences than the trade union movement; the memory of the working-class movements is a long one. It is therefore all the more important in the light of recent events to examine the origins and development of trade-union organization over the decades if we are to understand the unions of today, which have emerged as one of the most crucial and strongest elements in the economy. This book is the product of twenty years’ detailed research and general reflection on the course of trade-union development, and ranges over the whole field of British trade-union history, from the early craft societies to the structure of modern trade unionism. It begins by illuminating the problems associated with researching and writing in this field, and goes on to trace the main trends of trade-union development, linking these with modern trade-union problems. Particular attention is paid to some of the important aspects of this history – the Owenite period, the so-called New Model unions, the origins of the Trades Union Congress, and more recent changes in trade-union organization. These themes are woven into a broad study which includes detailed investigation of individual trade unions (particularly the printing unions, and also an early employers association) with a general review of the whole movement. 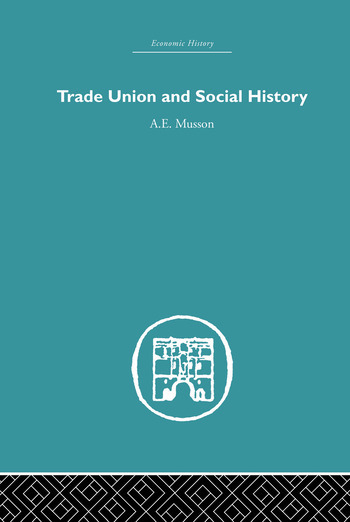 Trade-union history is closely bound up with social conditions, and Professor Musson also examines a number of such related aspects as the struggle for a free press, the origins of the co-operative movement and the early factory system. This classic book was first published in 1974.